The brewing process is an ancient art where malted barley is converted to alcohol by fermentation with yeast. Hops are added to flavour the beer, and to balance the sweetness of the malted barley. ﻿﻿﻿The ingredients of Kinver beer are local water, malted barley to provide a source of sugar to ferment, yeast and hops. Kinver brewery moved to new larger premises at Britch Farm on the outskirts of Kinver in June 2012. The move allowed the brewery to invest in larger brewing equipment, including a new hot liquor tank, mash tun, filters, cooler, copper and control equipment fabricated by the local firm PVSL who specialise in fabricating tanks, process systems and piping solutions. 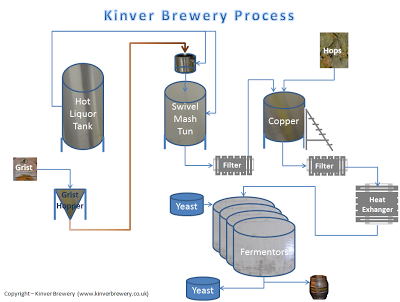 The local authority water supply used at the Kinver Brewery is hard, which makes it ideal for brewing without any further treatment. The liquor tank is filled with cold water recycled from the chiller, and heated to 75'C ready for the next brew. Whilst there is a spring available at the Brewery, it was decided not to use the water from the spring in order to ensure a consistent product. Once the cold liquor is heated to 75'C, then the hot liquor is transferred to the mashtun. Once the liquor has reached the required temperature of 75'C, locally sourced malted barley is added to the grist hopper, and transported by a screw feed to the mash tun. Kinver Brewery exclusively use floor swept malt from an english malting company at Warminster. Special malts are chosen and blended according to the brewers recipe. On entry to the mash tun, the ground malt is sprayed with hot liquor. This aids the dispersion of the grains in the mash tun. The mash tun is filled with hot liquor and then maintained at 65'C for about 90 minutes to allow natural enzymes present in the malt to convert starches released by the malting process into sugars that can later be fermented and converted to alcohol. 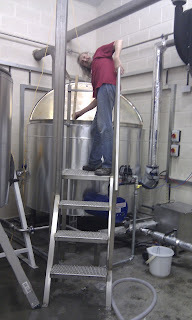 The mash tun swivels to aid cleaning. The Kinver Brewery mash tun is a unique swivel design which tilts to make cleaning easy. The mash tun was designed and built by a specialist fabricator, PVSL, who are located next door to the Brewery at Britch Farm. 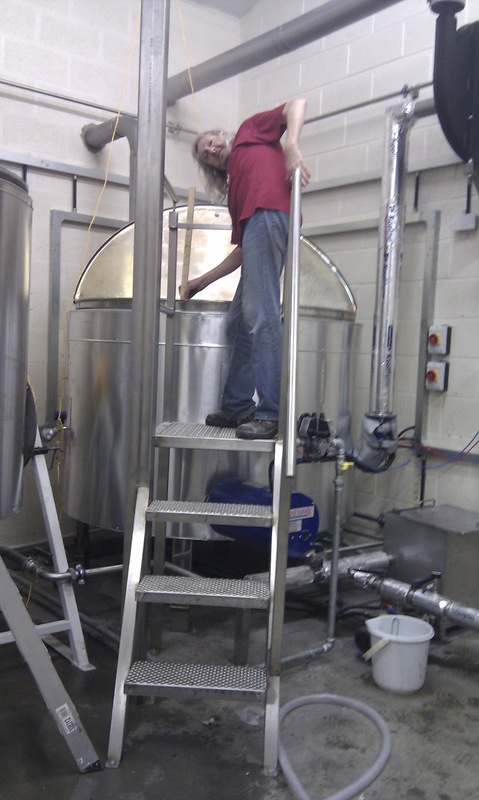 Kinver Brewery have a special wort stirrer to aid the dispersion of the malt in the mash tun. The wort is boiled in the copper for 60 minutes to concentrate the wort, to stop the enzyme conversion process, and sterilise the wort. The finest Hops are added to the copper for flavour and aroma. Kinver brewery use hops from around the world, depending upon the style of beer being brewed. The process is controlled with the latest control equipment installed by PVSL. The hot wort is transferred to through the hop back filter and cooler to the fermenters. The cooler chills the wort and reduces the temperature to 18'C. The cooling water is recycled to the hot liquor tank. The fermenters are sealed tanks. The hot wort is cooled to 18'C, and dry yeast added to convert the sugars to alcohol. The fermenting process generates heat to maintain a constant temperature of 22'C. The brew is fermented for a week, and then racked off to the barrels to condition. Check who has had a drink of Kinver beer recently?